One of my all time favorite sites is Lifehacker.com If you’ve never checked it out, I highly recommend it. I find tips and tricks on there all the time from organizing to technical to parenting it covers everything! So, I thought it would be fun to share my latest life hack! Wow! I know, how did I ever find anything in there? It usually came with frustration and a few choice words. Then with a little luck I untangled whatever I was looking for and them threw it back in the bin. 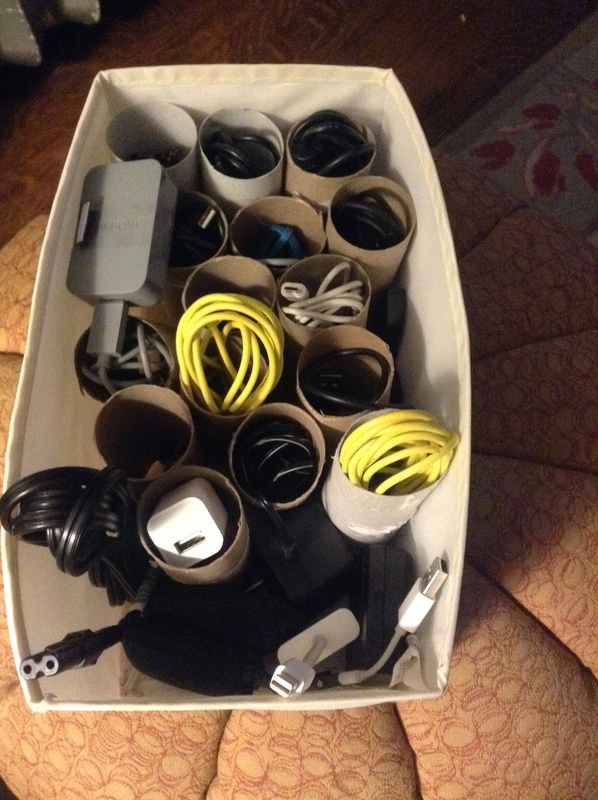 With a few empty TP rolls or paper towel rolls cut in half, I now have an organized, functional cord bin. I can find and put anything away, quick! 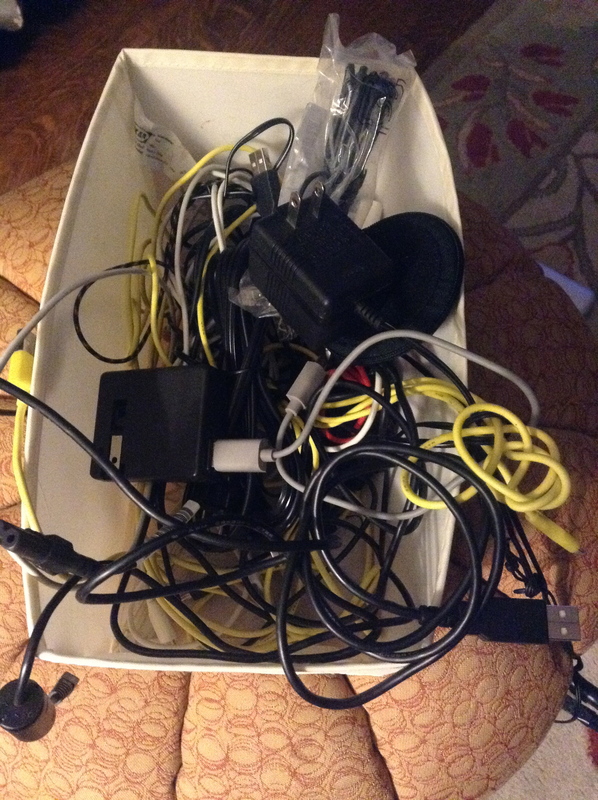 It took me about two weeks to collect the rolls and all of 15 minutes to untangle the cords and put them back in the bin. This was a fun simple project. And probably one of the best hacks I’ve done so far. Here’s an article to get you started on a life hack or two of your own, it’s where I got the TP roll cord holder idea! Share your hacks in the comment section, I’d love to see them! 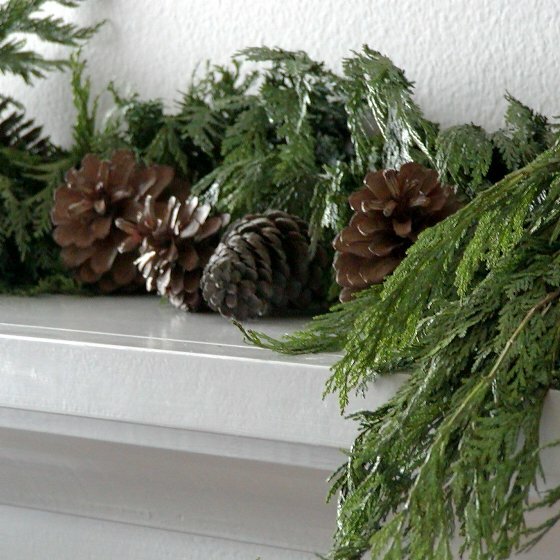 I’m getting crafty today with a step-by-step video to make garland for your home this holiday. I moved into a new home last year with a fabulous fireplace and mantle that was begging to be draped in a luscious green garland for the holiday season. I put together this video for you to follow along and make your own garland for you home. Garland can be used anywhere, not just on the fireplace. Think about garland as a table center, on a ledge or over a door. It smells amazing and gives any home an instant holiday update. I would love to see pictures of your garland in the comments below. Happy Holidays!